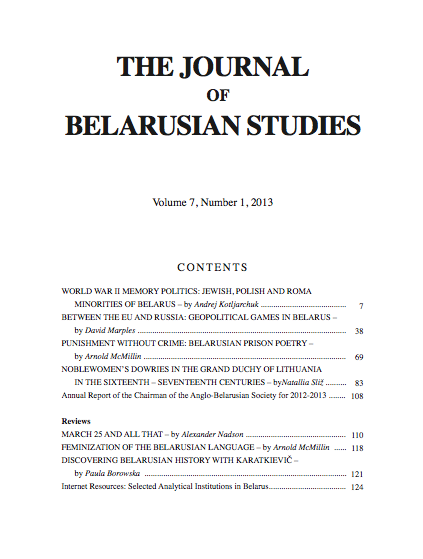 The Journal of Belarusian Studies will relaunch in London on 21 May 2013. The Journal has been dormant for nearly 25 years and now the first issue has appeared after a long silence. Yaraslau Kryvoi, Arnold McMillin, Jim Dingley, Fr Aleksander Nadson and Andrew Wilson will recall the history of the Journal, which started in 1965, present the new issue and plans for the future. The participants will also reflect on what has changed for Belarusian studies since 1980s. The new issue of the Journal will feature articles of Andrej Kotljarchuk, David Marples, Arnold McMillin and Natallia Slizh. It will be possible to purchase hard copies of the new issue of the Journal. A cheese and wine reception will follow the panel discussion. The event will start on 21 May at 18:30 in Room 431, School of Slavonic and East European Studies, University College London, 16 Taviton Street, London, WC1H 0BW (Map). To reserve a place please complete the following form indicating your name, email and affiliation. The hard copy of the Journal can be purchased online here. This entry was posted in ABS and tagged Andrew Wilson, Arnold McMillin, Belarusian Studies, JBS, Journal of Belarusian Studies, SEES, UCL. Bookmark the permalink.